Anyone who’s paid attention to the headlines in recent days knows several things about what’s about to happen to their wallets. First, oil is well past the $100 per barrel mark ($106 at the time of this writing) and second, areas in Alaska are already seeing per gallon costs of $6 and more. Some areas in Florida are nearing the $5 per gallon mark, too – and the rest of the country isn’t far behind. Just when we thought fuel prices were beginning to level out to some degree, just in time for the busy summer travel season, they begin increasing yet again. What makes this year so different, however, is first, the unrest near Iran and unlike other seasons, it’s not been a gradual one-cent a day increase, but instead, we’re seeing significant jumps in the per-price gallon prices. No one’s quite sure what will eventually happen; after all, when politics are at play – and certainly politics on an international level – the only consistency is the inconsistency. What we can do, though, is cover the bases when it comes to our wallets and which credit cards we use to fill up at those gas pumps can make a big difference in those efforts. So whether you’re stressing over the fact that it now costs more just to show up at the office each day or if you’re thinking, “Another vacation that will have to be cut short”, check out some of these credit card offers designed for those looking for ways to save at the gas pumps. Between the cash back bonuses to the percentages saved while we’re filling up, these are sure to make you feel a bit better every time your gas needle inches closer to the dreaded “E”. One of the more popular travel rewards cards on the market these days is offered by Discover. Members earn up to $120 in travel rewards along with 1,000 bonus miles each month they make a purchase during the first twelve months. Plus, you’ll earn one mile for every dollar spent and there’s even an intro 0% APR on both purchases and balance transfers. If your preferred method of travel is via the airlines, you’ll like the absence of any restrictions on airline travel. Fly on any airline and book any hotel or car with no worries about blackout dates. The flexibility is also another popular reason many choose Discover Miles. You’ll enjoy redemption options like travel credits, merchandise, gift cards or yes, even cash. Travel benefits such as secondary collision damage when you rent a car is just one of those additional perks. Remember, too, for more than 15 years, Discover has maintained the top spot in customer loyalty. Sometimes, it’s all about the bonus cash back and with this Chase offer, you’ll earn $200 cash back after spending just $500 in your first three months of membership. This is where it gets good, though. 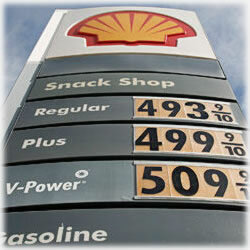 Card members earn a whopping 5% cash back on the first $1,500 spent at gas stations through the end of March 2012. After that, you’ll have new 5% cash back categories (they rotate quarterly). You’ll save big at the grocery store, your favorite airline and restaurants. Many consumers say activating their bonuses is a breeze, too. Shop through the Chase website for even bigger savings – up to 10% cash back. No annual fee and worries over expiration dates on your rewards seals this deal up. Finally, we take a look at one of the newer Capital One offers. This Capital One boasts a $100 cash back bonus after purchasing $500 in the first ninety days. You’ll also earn 1% cash back on all your purchases and a 50% bonus on the cash back you earn every year. No annual fee, unlimited cash rewards and a 0% intro APR on both your purchases and balance transfers from now until February 2013. This equates to impressive savings that will certainly offset those pesky rising prices at the pump. We might not can control the politics that dictate the prices we pay at the pump from day to day, but with a bit of careful budgeting, a smart credit card choice and of course, casting our ever-important votes come November, we can regain some of our power – and more importantly, control over our own expenses.